Wire Wolf – Professional Engineering Co., Inc.
Is it possible to cut down 400% more ceiling grid in the same time as conventional methods and do it more safely? 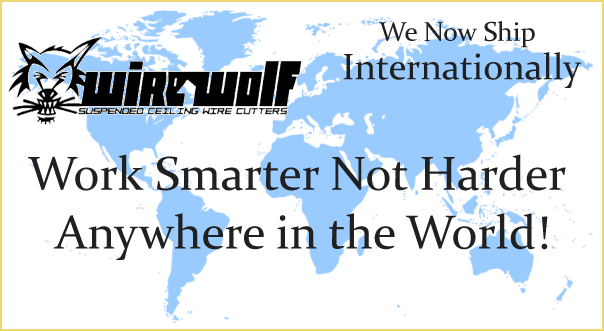 With Wire Wolf™ Suspended Ceiling Wire Cutters it is! 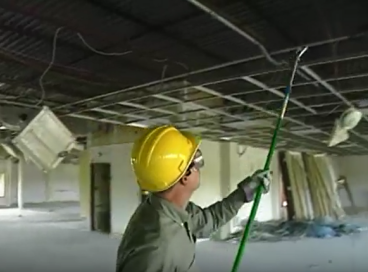 This revolutionary product developed by Professional Engineering, Co.(PECI), is the first patented demolition tool engineered to safely cut down suspended ceilings from the floor – eliminating the need for ladders and staging and greatly reducing the risk of injury. Because this tool is so easy to use, one laborer can cut down 5,000sq. ft. of suspended ceiling in one hour! Wire Wolf™ allows workers to stay on the floor while working rather than having one worker above on staging to cut wires and one below to clear away debris. With the Wire Wolf, workers simply walk over the debris and continue to cut down ceiling grid while other workers follow behind to clean the floor. The total weight of the tool including the extension pole is only 4 pounds and it can easily cut a 9 gauge wire. The heavy duty 3 section aluminum extension pole extends up to 18 feet. The replaceable cutter blades are made from heat treated tool steel that on average can cut over 100,000 square feet of ceiling grid down before needing to be replaced. Whatever your needs are, this durable tool is an exceptional value! Don’t take our word for it, visit our Testimonials page to see what our clients have to say! Work smarter, not harder with Professional Engineering Co, Inc tools! PECI manufactures a line of the highest quality state-of- the-art demolition tools with worker safety and efficiency as our guide. Interested in learning more about our tools? Contact Us today!